WHERE DID THE WORD ‘JEEP’ COME FROM? Here’s a fun bit of World War 2 trivia. 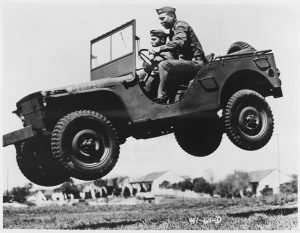 The Jeep was one of the most important weapons of World War 2. 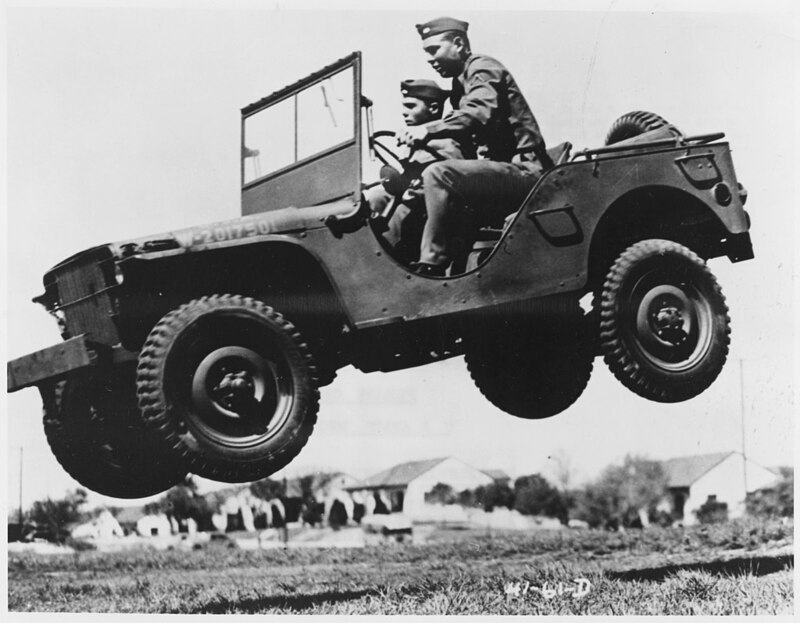 Jeeps gave American soldiers a huge edge over the Germans and the Japanese. That’s because the Jeep was the only mass-produced vehicle in the world that had 4-wheel drive. 4 wheel drive was invented in the late 1930s. Because the Jeep had 4 wheel drive, it could go places that no other wheeled vehicle could go. Jeeps could go across sandy deserts in North Africa and muddy field in France, places where German vehicles got stuck. But – where did the word ‘Jeep’ come from? There are a lot of stories and myths about this; however, we actually do know where the word Jeep came from. In the 1930s, one of the most popular cartoon characters in America was Popeye the Sailor. The Popeye comic strip appeared every day in newspapers all over the U.S., and Popeye cartoons were seen in thousands of movie theaters all over the world. In 1936, a new character started appearing in Popeye cartoons named Eugene the Jeep. The Jeep was a strange creature with supernatural abilities. Eugene the Jeep could go anywhere and do anything. There was no obstacle that the Jeep could not instantly overcome. In 1941, the Willys Motor Co. began making a new vehicle for the U.S. Army with 4 wheel drive known simply as the Willys MB. Soldiers were astonished at the ability of this vehicle to go over terrain where no wheeled vehicle had ever been able to go before – and at high speed. We don’t know who was the first person to start calling this vehicle a Jeep, but whoever it was, the name caught on quickly and stuck. 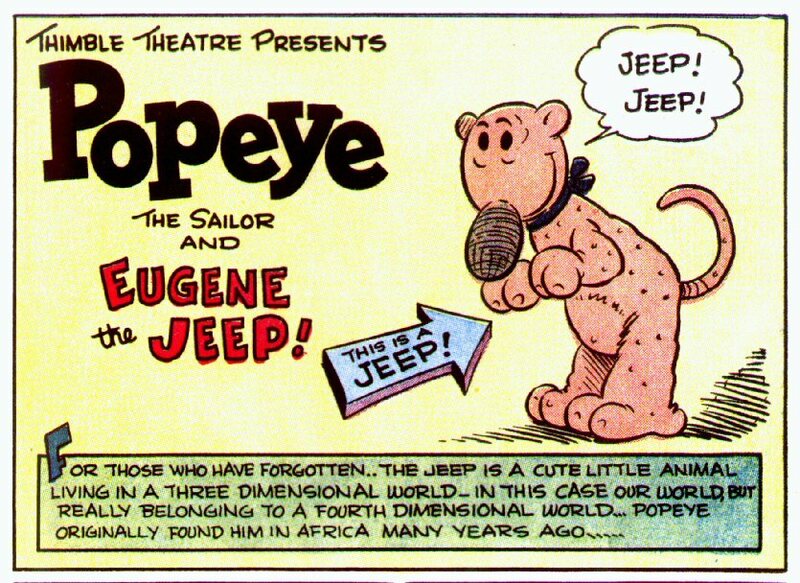 Below are pictures of Eugene the Jeep and a early model Willys MB. This entry was posted in Tenant Newsletter and tagged eugene the jeep, jeep, popeye, world war 2 by Mark. Bookmark the permalink.